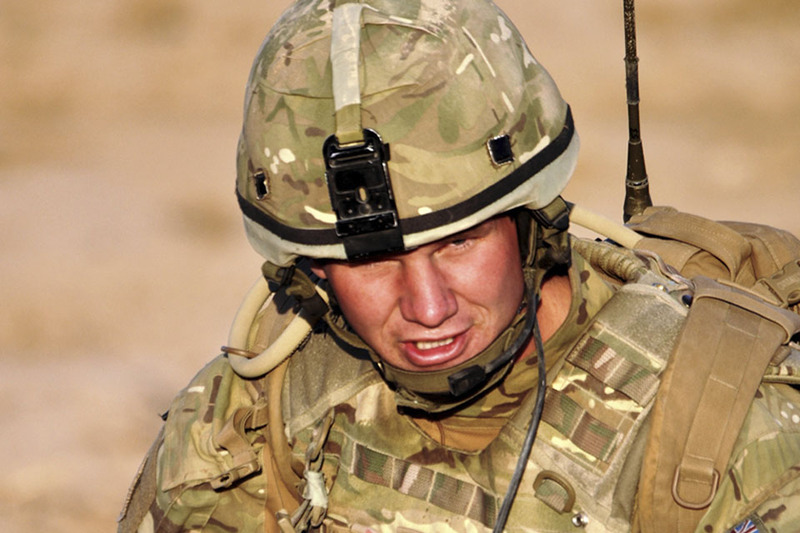 Corporal Jamie Williams from The Argyll and Sutherland Highlanders, 5th Battalion The Royal Regiment of Scotland (5 SCOTS), is based in Patrol Base Attal on Route 601 near Lashkar Gah. Here he writes about how the Taliban is losing the support of the local population. In Delta Company we have worked hard over the last six months to establish security and freedom of movement on Route 601. This is a vital route which connects the provincial capital and largest city in Helmand, Lashkar Gah, with the centre of commerce, Gereshk, and these cities in turn with the neighbouring province of Kandahar. Kandahar City is the major city in southern Afghanistan and the key city in the Pashtun ethnic belt. As such, this route and our task have strategic implications for bringing normality and security to the day-to-day lives of the Afghans. Throughout our tour we have been very aware of the problems with security and insurgent influence to the north and south of Route 601 which have remained while we have focussed primarily on the route itself. A recent patrol by Delta Company and our Afghan Police partners took us to Alokozi Shah, an area south of the village of Popalzai, itself a few kilometres south of Route 601. The patrol was relatively quiet throughout and the locals seemed very co-operative and happy to see us. It is such ‘atmospherics’ we look out for in any area we operate in, the response of the locals to our presence is a key indicator of how active the insurgency is in the area. I was reassured by the mood and took it as good a sign that our work in the surrounding areas providing security and driving out the insurgent fighters was having a positive effect. After patrolling through several villages and stopping now and then to talk with locals, we stopped a car which was passing by, to get some more intelligence on who was moving through the area. This driver was Abdul Haji Shaz, an influential local businessman who owns a number of compounds and petrol stations in the area. Abdul invited us to one of his nearby compounds where we were treated to the famous Pashtun hospitality in earnest and enjoyed chai, nuts and sweets. Abdul, who divides his time between business interests in Alokozi Shah and Lashkar Gah, told us his story. Abdul Haji Shaz had moved away from Alokozi Shah some years ago because of constant insurgent control of the area. The insurgents had taxed heavily any crops that were grown and the locals had lived in constant fear of the harsh justice they imparted. He had taken his children to Lashkar Gah to give them a chance of a better life away from insurgent influence. I asked Abdul why he was now back in the area. His response, which I had hoped for, was that he had returned in recent weeks because he had heard that security was much better than it had been and that British troops along with their Police partners had pushed the insurgents out of the area. I have been hearing on the local radio about how good the security is and my brothers keep telling me this as well. I have now witnessed for myself that the area is much better. I have also heard about the plans for the new school and think that if the security continues to increase then it will be a great opportunity for our kids to get the proper education they deserve. This, while only one of hundreds of encounters I have had with locals during my time in Helmand, was not an isolated incident in terms of the positive message I received. This stood out in my mind as an important meeting as Abdul is an influential local elder, respected and looked to for decisions and advice by hundreds of other villagers. It is evident to me that the effect of the increased security and development which ISAF troops and our Afghan Police partners have fought hard to bring is now taking hold. The message is spreading that the Afghan government are the better option and the insurgency are losing the support which they need to survive. If this momentum continues then more Afghans who desire a good life will return to the area and support the legitimate government and security forces in the area, denying the insurgents what they want the most, control of the population. 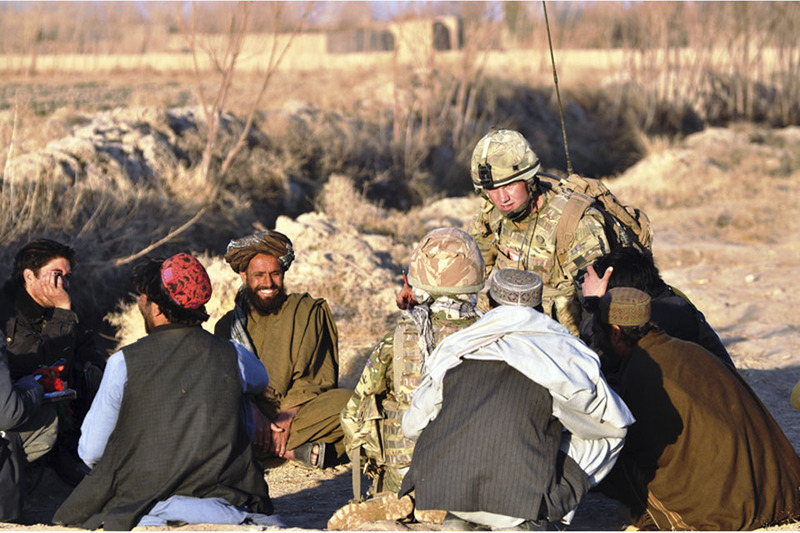 This kind of encounter is now happening every day across Helmand and signals the turning of the tide in Afghanistan. 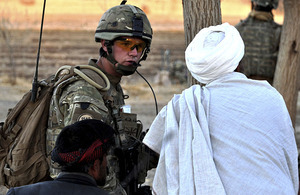 Corporal Williams works alongside the 2nd Kandak of the Afghan Uniformed Police (AUP) commanded by Colonel Abdul Sattar. 5 SCOTS are currently the PDATT (Police Development and Advisory Training Team) within Task Force Helmand.